InfraGard is a partnership between the FBI and the private sector. It is an association of persons who represent businesses, academic institutions, state and local law enforcement agencies, and other participants dedicated to sharing information and intelligence to prevent hostile acts against the U.S. 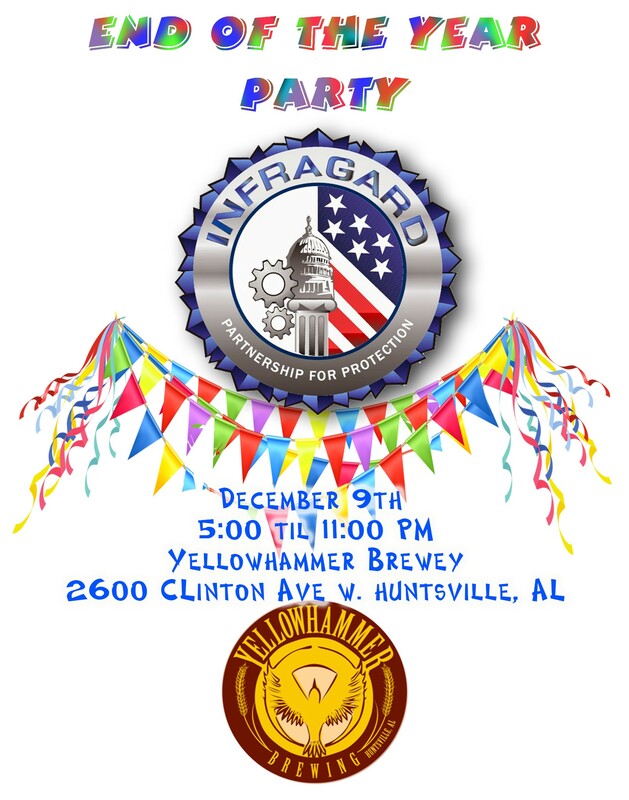 The Huntsville Chapter of InfraGard meets on the first Tuesday of every month. Meeting details are posted on this website at least one week prior to every meeting. 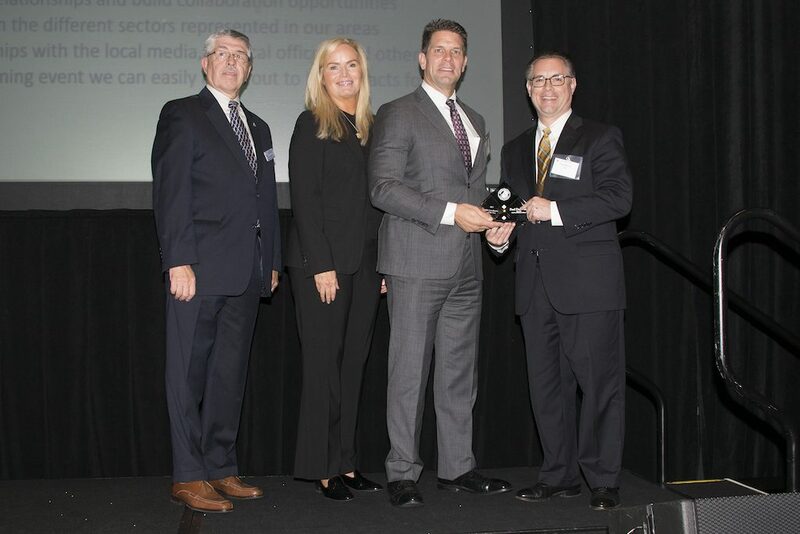 Please join us in congratulating our very own Paul Daymond for being the 2017 InfraGard FBI Coordinator of the Year! Paul was presented this award at the InfraGard National Members Alliance (INMA) Congress & 2nd Annual Conference in Dallas, TX, in September. Our October Speaker is MAJ Jonathan Poarch, Commander, 175th Cyber Protection Team, Alabama Army National Guard. MAJ Poarch has earned an Associates Degree in Computer Science from Jefferson State Community College, a Bachelor’s Degree in Business Administration and Management from the University of Alabama at Birmingham, and a Masters Degree in Human Environmental Science from the University of Alabama. He is also a Certified Information Systems Security Professional (CISSP), a Certified Ethical Hacker (CEH), and a CompTIA Advanced Security Practitioner (CASP). MAJ Poarch is a recipient of the Southern Research Institute Technical Excellence Award, the Alabama Commendation Medal, the Army Commendation Medal, the Meritorious Service Medal, and the Bronze Star Medal. ALL attendees must RSVP (with or without lunch). Note: Our host request we park at the rear of the building. There is ample parking available. Speaker: Christine Karlson, current InfraGard President and National South East Regional Representative. A buffet lunch is offered for $20 (must show receipt). Earn 1 hour continuing education unit. Make sure your RSVP by September 4th at 8:00am and don’t forget to mark you lunch order. The Houston and Galveston Texas area is experiencing the worst natural disaster in America’s history, as they battle Hurricane Harvey. Thousands have lost everything, and millions will be recovering from this disaster not for weeks or months, but for years. Protecting our critical infrastructure and supporting the FBI mission is the foundation of InfraGard and the FBI Citizens Academy Alumni Association. Together, as one family, we can help the victims of Hurricane Harvey. The FBI Citizens Academy Alumni Association and the InfraGard Members Alliance family are teaming to bring some relief to our brothers and sisters in the affected area by setting up pathways for goods and monetary donations. Designate all donations for Houston Relief Fund. Tax-deductible donations can be check, ACH, wire transfer, money order, or other electronic or paper donation. Cash is discouraged. Checks should be made out to the FBI Birmingham Citizens Alumni Association, in the memo line indicate “Houston Relief Fund.” The Salvation Army will receive 100% of the monetary donations. Mr. Diamond is the liaison to the business community and the Mayors DEO, Cyber, Energy, and Broadband Initiatives, including efforts to attract Google to Huntsville. Make sure your RSVP by July 31st at 8:00am and don’t forget to mark you lunch order. ALL ATTENDEES MUST REGISTER NO LATER THAN APRIL 28 (to verify memberships). Coming apart over DFARS compliance requirements? Chandler is a Cybersecurity Evangelist for Sentar, Inc and has been a marketing technologist, as well as holding Board of Director, Board of Technical Advisor and consultant roles over the past twenty years. He is a successful entrepreneur of several computer and network security companies, an Internet of Things networking company, a 911 call-taking software company, and a Biotech firm. Chandler graduated with honors and holds a Bachelor of Science in Business Computer Science from Jacksonville State University. Make sure your RSVP by April 3rd at 8:00am and don’t forget to mark you lunch order. Make sure your RSVP by March 6th at 8:00am and don’t forget to mark you lunch order. Make sure your RSVP by February 6th at 8:00am and don’t forget to mark you lunch order. Come celebrate our amazing year! We will meet at Yellowhammer Brewery to eat dinner and socialize. This is a great networking opportunity. Bring a friend and introduce them to the benefits of InfraGard membership. Members and guests should both register please! This event is only open to InfraGard members and their guests.